When I heard the only way to halt overnight at Chandra Taal was tents in a camp under the sky, I knew this adventure was for me. The best was saved for the last day of the road trip. Today, it was not only about the journey but also the destination. “Every hundred feet the world changes”. It was quite literal here. To my left, I saw the horses sauntering ahead skimming the ground and to my right bulky yaks ruminated, calmly eyeballing the trespassers. It was early noon when we reached Losar village, our only lunching option before Chandra Taal. While we ordered for a meal, three very young bright and bouncy locals loomed over me. I was as thrilled to see them as they were to see outlanders. I got us clicked, wanting to take this moment back with me. Our next stop was Kunzum La (Kunzum pass), one of the highest motorable mountain passes that remains open only 3 to 4 months each year. You can never be sure if you’d be able to go past it. One can only hope the weather conditions are as you anticipate it to be. After passing a stretch of arid land, as we approached tons of colourful prayerflags, we knew we were there. Rows of tall wooden posts interwoven with multicoloured beating pieces of candor, framed a path leading to the Chortens. An age old temple situated there, marks the pass. There are many beliefs surrounding this shrine and it’s divine goddess, which probably arose when the wrath of nature was feared and less understood. The deity is believed to protect the pass and it’s passersby; many people even today make it a point to bow to or ceremoniously circumambulate the deity. Whether you pray or not, it definitely is a great idea to pull over here. Devouring the erratic patter of the prayerflags, I stood surrounded by snow clad peaks, large glaciers and sheets of yellow green overlay draped on vast ripply lands. Visible from here were, Bara-shigri glacier (meaning big glacier in the local lahaul dialect), the second largest in the Himalayas, and also the Chandrabhaga range of mountains. We still had around 7-8 Kms to reach Chandrataal Lake (meaning, Lake of the moon in Hindi). Our vehicle suddenly came to a halt before, what looked like, a traffic jam! Roads (if they could be called so) crossed the paths of flowing glacial water and were not stable to let vehicles pass easily. A car with low ground clearance was stranded, surrounded by the other drivers who were collectively trying to pull it out. Our driver joined in too. One by one they ensured every vehicle crossed over. “This is the daily scene on this road, we always look out for the other vehicles. If we don’t help each other out, who will?” said our altruistic driver, when I enquired. The roads were as treacherous as the claims, spiraling over cliffs and running over flowing glacial water. But hey, there at least was a road (although a gravel one with big loose rocks)! It stumps Google maps even today, which is unable to find this route for you. People had to trek their way to this lake a few years back and now it’s an option available to the adventure seekers who have time on their side. Thanks to our experienced chauffeur, who knew exactly how much to veer the vehicle to keep its wheels from sliding off the edge of unguarded slippery roads that ended abruptly, we had nothing to worry about except that bad luck could even defeat experience sometimes! After leaving behind our vehicle at the parking lot in a barren area, I walked ahead looking for the lake that was still out of sight. After a kilometer or so, the turquoise blue tip of the lake revealed itself. An extensive crystal clear lake stood still as the wind grazed it, crumbling its surface. Bare brown mountains, recently stripped off of their white canopy, bowed and arched towards the crescent aquamarine lake from all directions. The surrounding snow peaks stretched far and wide. The shimmer on the lake changed tints as I walked around the 3 km rim of the lake. Hidden away so deep in the Himalayas at an altitude of 4300 meters, and having this enigmatic an effect, it was evident why there are so many legends surrounding it. It’s been called the gateway to heaven and been unified to the gods and fairies. What mystifies the lake further is the lack of a visible water source. There were no manmade structures around, except for a few camp sites. Camping is not allowed 3-4 kms around the lake. The tent I stayed in, ran on a generator source for electricity after sundown, which was switched off by 8 pm. I used my light from my phone to move around the tent. After a while, my battery died and I had no backup. I couldn’t just walk into a hotel or a café and plug it in. But, it didn’t bother me. I had never been happier without my phone! Outside, it was lit by moonlight. Every single star was visible in the sky that night, or so I thought. The temperature that night dipped below zero degrees. I used up all the warm clothes I had on me and it still took a while to get warm under the blanket. Retiring after a memorable day, as I slowly succumbed to the fatigue, I distinctly remember not wanting the night to end. 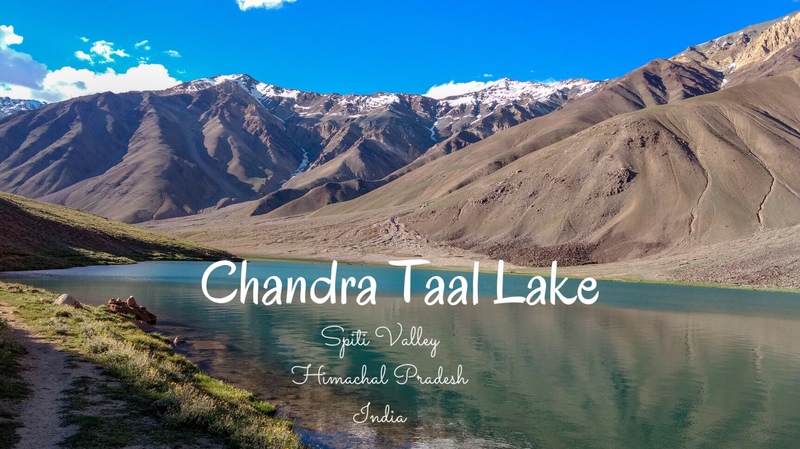 Have you been to the Chandra Taal Lake yet? Do share your thoughts or experiences! Best way to get here is to hire a private vehicle with an experienced driver. Weather here is unpredictable. Dress in layers. Carry adequate sun protection gear. Indian homely food is served in the camps. There are no eat outs in Kunzum La. The closest one is in Losar which serve basic food comprising of rice, roti, dal and mixed vegetables. It’s better to travel from Kaza to Chandra Taal Lake rather than from Manali to avoid acute mountain sickness.